Edit definition allows to modify the parameters of an existing feature. 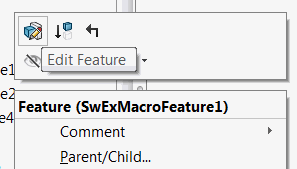 Edit definition is called when Edit Feature command is clicked form the feature manager tree. Rollback the feature in the tree via IMacroFeatureData::AccessSelections. This will ensure that all the feature selections and edit bodies are available. Create user interface and allow user to edit parameters. The recommended way to use Property Manager Pages to have a native look and feel of your feature. Use SwEx.PMPage framework for simplified way of creating property manager pages. It is important to use the same pointer to IMacroFeatureData while calling the IMacroFeatureData::AccessSelections, GetParameters, SetParameters, IFeature::ModifyDefinition and IMacroFeatureData::ReleaseSelectionAccess methods.